3" FlexPVC® Flexible PVC Pipe 3.500" 3.00" 50 psi 125 psi 12" 28"
✝ Yes, the standard flex has a smaller bend radius than the EZ-Flow Thinwall flexible pvc pipe. If you bend the EZ-Flow Thinwall too far it'll kink because it's thinner wall. Standard flexible pvc pipe will bend tighter, but you'll need more force to do it. If you require options with slightly larger diameters, check out our 4-inch and 6-inch flexible PVC pipe. Read about our LIFETIME LIMITED WARRANTY! 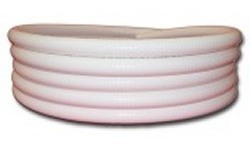 THIS 3 INCH FLEXIBLE PVC HOSE IS MADE IN THE USA, not like the imported junk that will spring holes in a couple of years.